Faced with the quintessential problem of foreign encroachment of Hawaiian territory, His Hawaiian Majesty King Kamehameha III deemed it prudent and necessary to dispatch a Hawaiian delegation to the United States and then to Europe with the power to settle alleged difficulties with nations, negotiate treaties and to ultimately secure the recognition of Hawaiian Independence by the major powers of the world. In accordance with this view, Timoteo Ha'alilio, William Richards and Sir George Simpson were commissioned as joint Ministers Plenipotentiary on April 8, 1842. Sir George Simpson, shortly thereafter, left for England, via Alaska and Siberia, while Mr. Ha'alilio and Mr. Richards departed for the United States, via Mexico, on July 8, 1842. "Her Majesty's Government was willing and had determined to recognize the independence of the Sandwich Islands under their present sovereign." 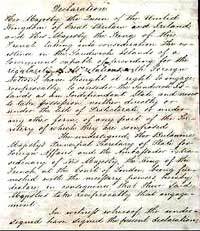 On November 28, 1843, at the Court of London, the British and French Governments entered into a formal agreement of the recognition of Hawaiian independence. "Her Majesty the Queen of the United Kingdom of Great Britain and Ireland, and His Majesty the King of the French, taking into consideration the existence in the Sandwich Islands (Hawaiian Islands) of a government capable of providing for the regularity of its relations with foreign nations, have thought it right to engage, reciprocally, to consider the Sandwich Islands as an Independent State, and never to take possession, neither directly or under the title of Protectorate, or under any other form, of any part of the territory of which they are composed. 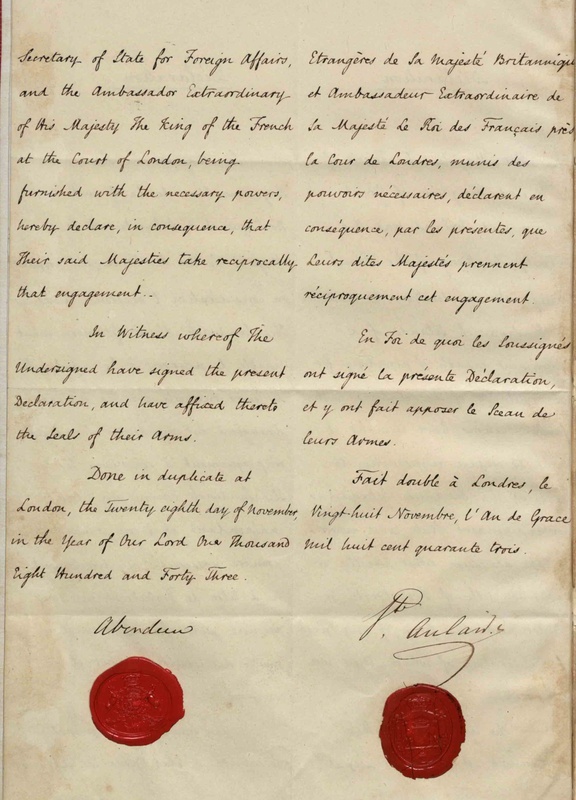 The undersigned, Her Majesty's Principal Secretary of State of Foreign Affairs, and the Ambassador Extraordinary of His Majesty the King of the French, at the Court of London, being furnished with the necessary powers, hereby declare, in consequence, that their said Majesties take reciprocally that engagement. 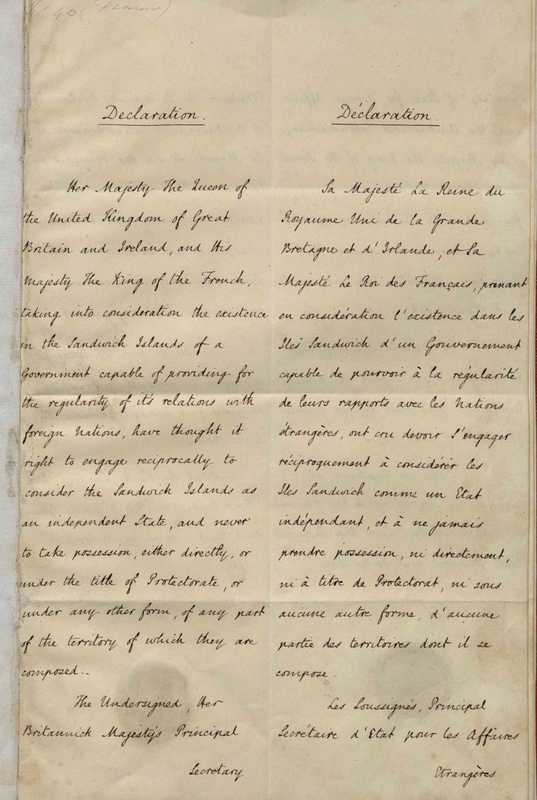 View page 1 and page 2 of the original Anglo-French Proclamation from the United Kingdom archives. On July 6, 1846, U.S. Secretary of State John C. Calhoun, on behalf of President Tyler, afforded formal recogntion of Hawaiian independence. As a result of the recognition of Hawaiian independence the Hawaiian Kingdom entered into treaties with the major nations of the world and established over ninety legations and consulates in multiple seaports and cities. Universal Postal Union in 1885 with Germany, the United States of America, the Argentine Republic, Austro-Hungary, Belgium, Bolivia, Brazil, Bulgaria, Chile, the United States of Colombia, the Republic of Costa Rica, Denmark, the Dominican Republic, Egypt, Ecuador, Spain, Great Britain, Greece, Guatemala, the Republic of Haiti, the Republic of Honduras, Italy, Japan, the Republic of Liberia, Luxembourg, Mexico, Montenegro, Nicaragua, Paraguay, the Netherlands, Peru, Persia (Iran), Portugal, Romania, Russia, El Salvador, Serbia, the Kingdom of Siam (Thailand), Sweden and Norway, Switzerland, Turkey, Uruguay and the United States of Venezuela. International Criminal Court (November 28, 2012). On December 10, 2012, the insrument of accession was deposited with the Secretary-General of the United Nations acceding to the Rome Statute accepting jurisdiction of the International Criminal Court in The Hague, Netherlands, over Hawaiian territory. Jurisdiction will commence March 4, 2013. 1949 Geneva Convention, IV (November 28, 2012) On January 14, 2013, the instrument of accession was deposited with the Swiss Federal Council, by its Foreign Ministry, whereby the Hawaiian Kingdom is a High Contracting Party. The Fouth Geneva Convention immediately took effect on January 14, 2013 as a result of the prolonged occupation. 1977 Protocol Additional to the Geveva Conventions of 12 August 1949 relating to Protection of Victims of International Armed Conflict (Protocol 1) (December 11, 2013) On December 16, 2013, the instrument of accession was deposited with the Swiss Federal Council, by its Foreign Ministry, whereby the Hawaiian Kingdom is a High Contracting Party. Protocol 1 immediately took effect on December 16, 2013 as a result of the prolonged occupation.